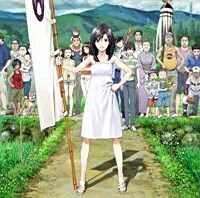 On first thought the name summer wars sounds like a movie about water fights where in reality it is more similar to the .hack series or the matrix on some points. During the summer, math genius kenji koiso goes with his secret crush and the school biggest love natsuki to her home to pretend he is her boyfriend. During his stay he gets a random text that is a jumble of numbers, he gets it wrong but many others get it right allowing a learning Hacking AI to take over the world’s biggest social control called oz which controls everything from street lights to emergency vehicles and space satellites. It then goes on a spree witch causes mass hysteria and global panic. This climaxes with it attempting to drop a satellite on a nuclear reactor witch Causes kill millions. To stop it, kenji, natsuki and her cousin who uses one of the most famous fighter avatars in oz known as king kazama to fight the AI known as love machine. Other than the simple fact that love machine would make a absolutely wonderful .hack// villain this anime is freaking awesome, spending its time in both the virtual and real world to hold it together with actions happening in both. Honestly I don’t want to say anymore or I’m worried I’ll ruin its awesomeness but everyone should seriously watch this movie or its awesome ness of 11/10 (yes I’m serious ) is going to waste!